Discussion in 'Mech Tech' started by Jonboy_t, Apr 17, 2019 at 11:41 AM. 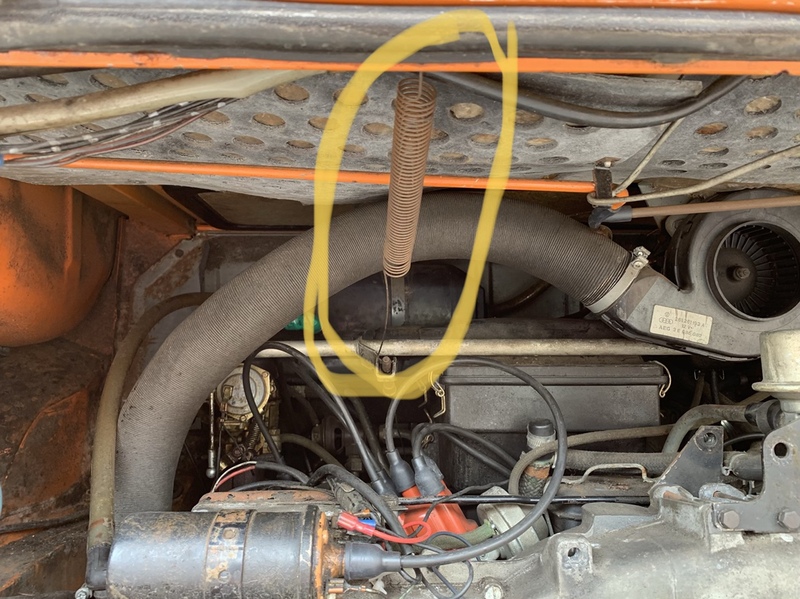 Doing a few bits to try and tighten up the throttle and have been looking to replace the below spring, but it doesn’t seem to be a normal part!! Is this a previous owner bodge up or am I looking in the wrong places?! I thought this was a weather posting tbh....I was going to mention being sunburnt in March, snowed out in April some years. Purple, cunny44, Bulletooth and 3 others like this. Yes I think that spring is normal stock. It is not made out of liquorice but rusty metal in a VW bus. Amazingly, it is original. Bit of an afterthought by VW, I think. Dunk it in some phosphoric acid (or even white vinegar) to get the rust off. Jonboy_t and F_Pantos like this. Ta very much . It’s not just the rust on it that’s a problem, it’s really floppy so the whole throttle linkage isn’t very tight. I’m gonna swap the linkage for one of Buttys jobs and change the carb springs for new ‘uns too, just wandering if it’s worth swapping that at the same time or even if it’d be necessary with those changes. Not enough material on the type I wear to stretch that far. Ermintrude and paul2590 like this. Your label's sticking out, Baz. Barry Haynes and monkeyvanwestybike like this. mgbman, Purple, Barneyrubble and 3 others like this. Pudelwagen, Dub and Dubber, Barneyrubble and 3 others like this. Back to the spring. Mine is the same as that. It’s only a light tension spring to help keep the throttles shut. If you want to tighten it a bit cable tie some of the coils together. Ooh. Mmmm. Grrr, big boy! Ermintrude and Barry Haynes like this. Have you got a note ? Should NOT make show of their cleft.